The announcement of the release date isn't new, as the March 15th leak had happened already, but what is surprising about the Disney Infinity 3.0: Marvel Battlegrounds playset is the fact it only comes with a single figure (Captain America: The First Avenger) instead of the customary 2 or 3. What bothers me even more is it's a character that many players already have, albeit with a new skin and potentially some new moves. One more issue is the fact that there are currently NO female figures for the set. Where's Scarlet Witch? Where's Captain Marvel? Where's Wasp? This set definitely needs a few female figures to balance out the roster. I suppose the good news is that ANY of the Marvel Infinity figures will work with the game, not limiting it to just the 3.0 group which is small to begin with. It's also been stated that many of the 2.0 Marvel characters have been "retooled" to be of better use in Battlegrounds. It is also a plus that the price is cheaper at $29.99 than before. 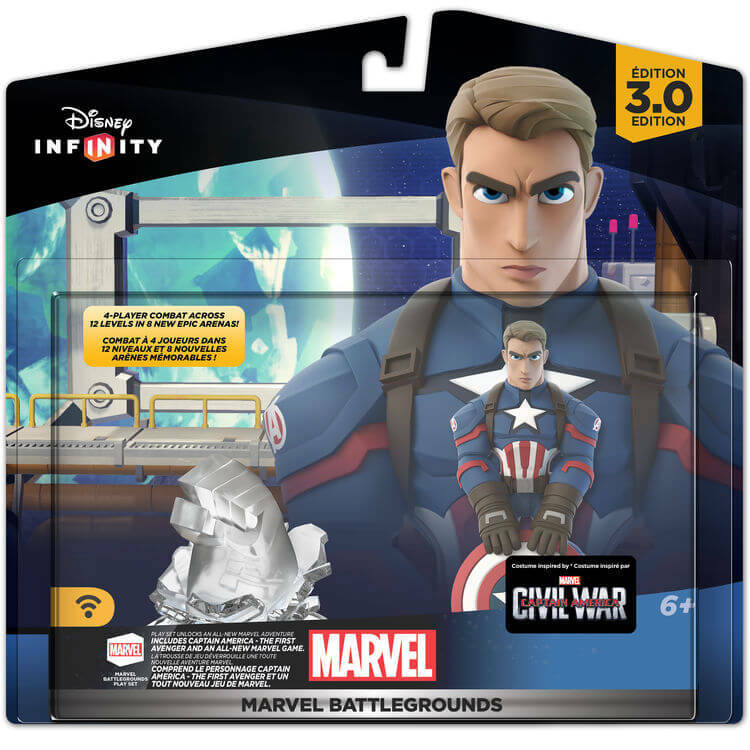 To pad this pack out they are offering a pre-order bonus from "Participating Retailers" (currently only Best Buy and the Disney Store) of any one of your choice of a Disney Infinity Marvel 2.0 figure. In addition to the figures listed as being part of the Battlegrounds wave (Ant-Man, Black Panther, and Vision) and the recent Ultron and Hulkbuster Iron Man, Disney is offering the Marvel's Avengers Figure Pack (consisting of Iron Man, Black Widow, and Thor from the 2.0 Playset) for $29.99. To me this is just an added slap to the face that instead of more new figures, they're once again offering old figures- at least the Captain America will be a little new. Marvel Battlegrounds is a four-player, arcade-style brawler that allows you to battle with up to three friends locally. You get to play in 12 levels across eight all-new arenas, including Knowhere and Wakanda. You’ll also be able to battle as any playable Disney Infinity (2.0 Edition): Marvel Super Heroes figure, making Marvel Battlegrounds the Play Set with the largest selection of playable characters. You guys know that the Disney Infinity team is always listening to your feedback, and we make changes along the way based on what we hear from the community. Your feedback has led to one significant change in our Play Set configuration. We heard from you that you want more choice in how you expand your Disney Infinity collections, especially with the Play Sets. With this in mind, the Marvel Battlegrounds Play Set Pack will come with the Play Set piece and one figure (Captain America – The First Avenger). Now it’s up to you to decide which other Marvel Super Heroes and Super Villains you want to fight with in Marvel Battlegrounds from a selection of 25 characters and with more to join the roster soon! All right, not to sound too nit picky here, but there will be 26* total figures available for Marvel, and 28 if you count the Black suit Spider-Man (which is getting a single release after the PS Vita pack exclusive) and the new version of Cap as separate, so there's already more figures than they've mentioned. So I want to know will there actually be more on the way that we've yet to see? Especially because this round of Marvel figures is so sparse. They always say there's some more to join coming, but what does that really mean? We want more individual figures, I mean if Battlegrounds is supposed to be such a game changer for Disney Infinity where's all the supporting figures like the Winter Soldier, Scarlet Witch, Wasp, or Captain Marvel? And no, we don't want more duplicates or repaints. Because I'm sure someone will suggest a War Machine that'll be essentially Iron Man with a gun, unless he's drastically different, it could rightfully be a costume disc. When it comese down to it, I'm wondering when we'll start getting major Marvel characters like Luke Cage, Daredevil, and Jessica Jones. Where's our the Agents of S.H.I.E.L.D. or Agent Carter? When will we get Squirrel Girl or Ghost Rider now that we've got his chain and bike as power discs? I can understand the IP rights feud keeping out the mutant population, but seriously, where's all the rest of the Marvel Universe. If battlegrounds is going to be this big thing, show us by giving us a huge selection of NEW figures to go with it. I don't know if I want to wait until Disney Infinity 4.0 for a Doctor Strange.